Which dental procedure is most associated with discomfort and pain than perhaps any other procedure? That’s right, a root canal. You probably have friends or family who’ve had one. And out of them, who said they absolutely loved getting a root canal? Our guess: no one. Even though seeing an extremely skilled dentist or endodontist will make it so that there’s minimal discomfort (if any), no one wants to hear that they need a root canal much less get one. But do you know why people need them? Or what a root canal even is? Most people don’t. So don’t worry if you aren’t able to answer those questions. The fact of the matter is, your friends and family probably let a few important parts of their oral health routine slip. You might even be doing the exact same thing now — especially as someone on the go who’s juggling work, school, dating, or family activities. When you consider how hectic most of our lives can be, it’s easy to see how our oral health might be swept under the rug. However, when that happens you put yourself at risk for needing a root canal! And we get it: When you barely have time for everything else in your day, you definitely don’t have time for a root canal. 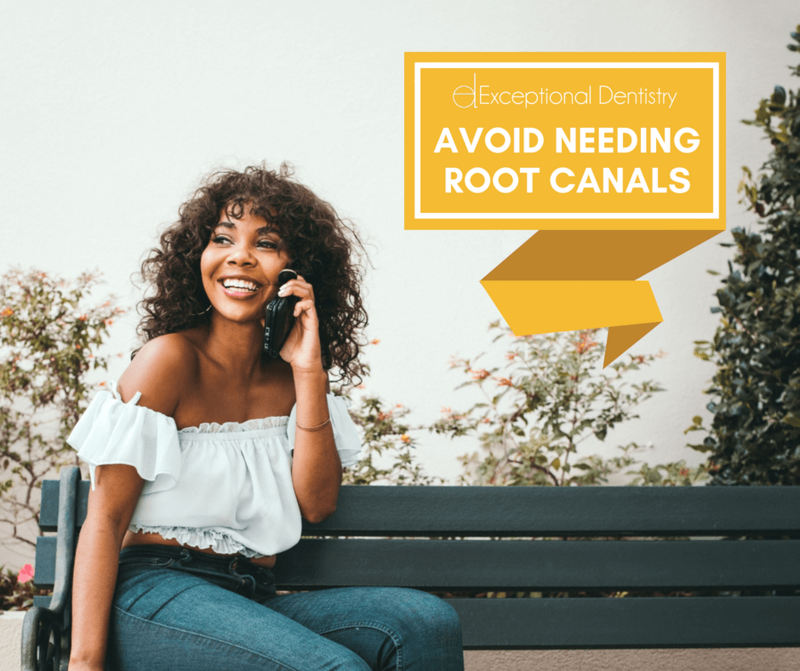 So let’s look at what our team here at Exceptional Dentistry in Palmdale, California, recommends you do to avoid needing a root canal in the first place. And we promise, it won’t take up very much of your time at all! What causes root canals to be needed? Root canal treatment becomes necessary when bacteria reaches the inside of your tooth. Underneath the hard surface of the tooth are soft tissues which contain blood vessels, nerves, and connective tissues. That little bundle of tissues and nerves is known as the pulp, and it helps keep your teeth “alive”. The pulp can become inflamed or infected due to things like allowing cavities to progress, cracks/chips, or injury to the tooth. When the inflammation or infection is left untreated, it can cause a lot of pain. It may even lead to an abscess (which could require an additional surgery). Obviously an infection isn’t something you want, nor is the pain that comes with it. Root canal treatment is the process of removing the infected pulp from a tooth. In order to save the tooth, the inside of the tooth is carefully cleaned, shaped, filled, and temporarily sealed. After the infected pulp has been cleaned, you’ll have to have your tooth re-evaluated to ensure that the infection is gone. Once cleared, Dr. James D. Powell can then permanently restore your tooth with a crown or onlay. This whole process typically takes multiple visits. So it can be quite the ordeal! Although now, we can dig into exactly how to avoid all this. The best way to avoid needing a root canal is simple – keep up a great oral health routine. No matter how busy life gets, how many times your children can’t find their shoes for school in the morning, or if you sleep through your alarm for work, you can’t skip brushing and flossing. By making sure you do your part at home, you’re taking the right steps towards prevention. Brush your teeth at least every morning and night with a soft bristled tooth brush. Use tools that help you do a better job, such as a Sonicare toothbrush & Hydrofloss. Change your toothbrush / toothbrush head every 3-4 months (damaged bristles don’t clean as well). Use prescription toothpaste like Fluoridex. Bonus points if you brush after every meal. Eat foods that help reverse cavities and avoid foods that cause demineralization. Another important part of a great oral health routine is seeing us regularly. We’re able to catch decay before it gets too deep & problematic with digital radiographs, and our Sopro Life early cavity detection cameras. So don’t skip out on radiographs when you are due! Being seen for professional teeth cleanings at the recommended intervals (typically 3-6 months). Being seen by Dr. Powell once a year for radiographs & an exam. Taking advantage of anti-cavity fluoride treatments when you’re here. Adding laser-bacterial reduction services to your regular preventative visits. As previously mentioned you should use a prescription fluoride toothpaste at home, and get anti-cavity fluoride treatments when you come in to see the hygienist. Fluoride will strengthen the outer part of the tooth and help prevent decay, so anyone can benefit from it — anyone with teeth, that is. Also, this might seem like common sense, but if you have a persistent toothache that doesn’t go away, swollen gums, or increased tooth sensitivity call us asap! These are the early warning signs of a pulp infection, and catching them early can sometimes save your tooth. Don’t let a root canal derail your day and throw a wrench into all of your important plans. Avoid a root canal and you’ll be much happier! Speaking of which, better get scheduled to come see us.